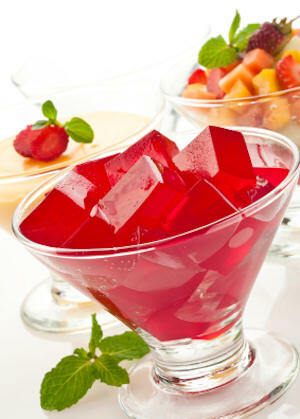 Take the gelatin in a sauce pan and add the cold water over it. Let it rest for couple of minutes till the gelatin gets fully soaked. Add the hot water to this and keep stirring till the gelatin fully dissolves in the water. Add the sugar and stir it again till the sugar dissolves. If needed heat the mix over low flame to disslove everything faster. Strain the mix into a large mixing bowl to remove any undissolved particles (if any). Take big chunks of watermelon and blend it to a smooth puree. Strain this also into the same mixing bowl. Add the lemon juice to this and mix everything together. Taste and add more sugar if needed i.e if the watermelon is not sweet enough. You can refrigerate this as such in the bowl till it thicken to a jelly. You can cut this into small cubes and serve, according to Onedaycart.com.